Libyan authorities say they have seized control of the western town of Bani Walid, a former stronghold of ex-leader Muammar Gaddafi. Pro-government forces, many of whom are from the rival town of Misrata, were shelling Bani Walid for several days. The clashes have forced hundreds of families to flee to neighbouring towns, according to the Red Cross in Tripoli. The government alleges that Bani Walid harbours a number of Gaddafi loyalists - a claim denied by the local militia. Authorities say all military operations have been halted, adding that troops will provide security and aid in the town, which lies about 140km (90 miles) south-east of Tripoli. A government official old the BBC's Rana Jawad that forces have taken control of the main hospital, the local radio station and the airport. But some pockets of resistance still remain, our correspondent reports. Omar Boughdad, a commander from the Misrata militia, said his forces would stay put to keep alleged Gaddafi supporters out. "The loyalists have fled to the valleys but we will clean up these places and will not leave again," he told the Associated Press. Dozens of people are believed to have been killed, and some 200 injured in the recent violence. Civilians escaping the clashes have found refuge in surrounding towns, where they are staying with families or in schools, the Red Cross said. 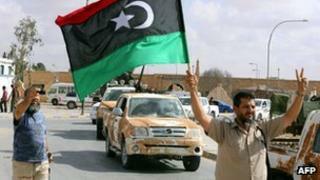 The fighting took place around the first anniversary of Gaddafi's capture in Sirte, on 20 October 2011. He was later killed near his hometown. Interim leader Mohammed Magarief has admitted that one year on, the country has not yet been fully liberated. Libya's new government has struggled to stamp its authority on a country awash with weapons.